Ever since the rain started this week, I’ve envisioned getting a shot of the Arizona Cardinals stadium (pathetically known as the University of Phoenix stadium) with dark clouds in the background. It was cloudy and rainy all day today, but there was a little daylight left and there was a pause in the downpour when I got home, so I grabbed the camera and drove over to Westgate, hoping to be able to set up the tripod in the parking lot and get a good shot. Of course, just as I got to the stadium the rain started up again….not a hard downpour, but enough that I didn’t want to set up the camera on the tripod without any kind of cover or shelter. So I rolled down the car window, rested the camera on the car door and fired off three bracketed shots of the stadium, trying to hold the camera as steady as possible. When I got home I ran the three shots through the Photomatix processor, matching on features rather than just correcting for horizontal and vertical shifts. I also checked the box to reduce the noise, although I’m not sure how much there was to be reduced. I then played around quite a bit with the tone mapping, moving the sliders from one extreme to the other to see how they impacted the image. Some effects are very subtle, some are jarringly obvious, but it was interesting (and sometimes frustrating) to see the image change with each adjustment. This entry was posted in Processing, Shooting and tagged Arizona, camera, cloud, D5000, Glendale, HDR, Nikon, Paint Shop Pro, photography, Photomatix, storm, tripod. Bookmark the permalink. Congratulations on getting onto the home page of WordPress. To me your picture is surreal. The impact of the rain on the parking lot almost looks like a lake. The darkness of the clouds and the spaceship like image of the building all make for a very interesting image. Also, since most people will wait till it is not raining to take a picture. You most likely have quite a unique picture of the stadium. Bravo. I read briefly your bio. I prefer to be in Nature too but sometimes the look of a building with the clear impact of dark clouds can be really something else. P.S. You can see an image of mountains I took from Needle Peak Summit on my home page. Here the clouds add some impact too. Nice pic. Just i tip, you can also make a HDR image from one RAW shot. You simply make 3-4 copies of the same RAW file, edit the exposure of them differently before combining them to a HDR image. Not the best solution maybe, but might be easier than bracketing handheld? :0) Try it. Wow, this is some nice thinking out of the box! 😛 Will surely try it out! Guess you are right, as you will not get a picture with as high dynamic range as when combining multiple shots to one HDR image. Nevertheless it can give you a better exposed sky in many pictures, as long as the sky was not totally burned out/overexposed in the original RAW file. You are probably right that the darker portions of the image will easily be a bit grainy. Fun to try out anyway, the result can be quite nice. It is a great shot. Very cool pic Suzanne. Although I live 200 miles from the stadium I’ve never seen it before (except on tv). I like the way the photo makes the wet parking lot look like it sits on a lake. Oooooh, this is impressive! The dark clouds overhead indicate some action going on, and the viewer can anticipate a lightning bolt flashing before the next blink. Way to go!! Bookmarked – I’ll be back soon to see your nightphotog topics. Thanks from Ralph aka http://draaiorgelfan.wordpress.com. Good lookin’! Way to make an HDR that doesn’t look like a clown threw up on it 😛 I explore with my Nikon too, samauger.wordpress.com. Check it out! hi, i come from indonesia:) nice to meet you all :)) visit my blog and leave comment ok? The composition seems to be off, but the intent was not to demonstrate that, from a car shot.. Very good info! Tons of HDR pics by Leicaman, he is real good. He runs a photolab out of San Antonio, Texas and lives on a ranch. http://www.leicaman.wordpress.com He is also a darn good father. Best of luck! nice pic. is this what they call monocromatic image? n i c e . . . . 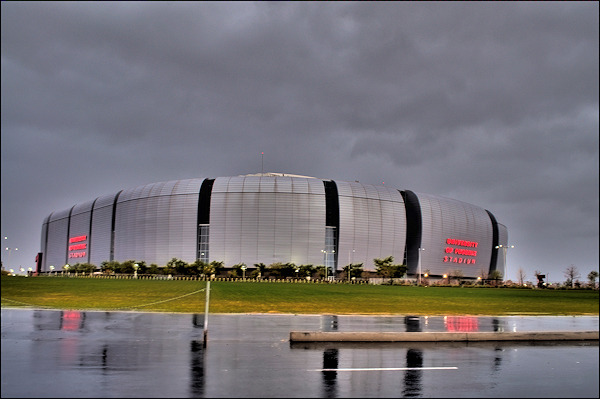 I agree; i don’t like the official name either – University of Phoenix Stadium. But hey, that’s better than another investor that pursued having his business’s name on the wall – “The Pink Taco Stadium”! Great. on handlheld HDR I try to do it only when there is a lot of light. My latest is this one. But I was head on with the sun.